My all time favourite herb. I would put it on anything if I didn’t get funny looks. It reminds me of spaghetti bolognese growing up, which we used to cover in parmesan, freshly ground black pepper and loads of parsley. It’s very good for you, but you’d need to eat an awful lot of it to get any benefits compared to other foods. Parsley actually contains more vitamin C per 100g than oranges, but think of how much parsley you’d need to make up 100g! The active ingredient in parsley is chlorophyll, which is thought to eliminate odours and bad breath. I’m not sure it works in people and haven’t really tested it out, but it would be a pretty handy thing for getting rid of strong garlic smells! 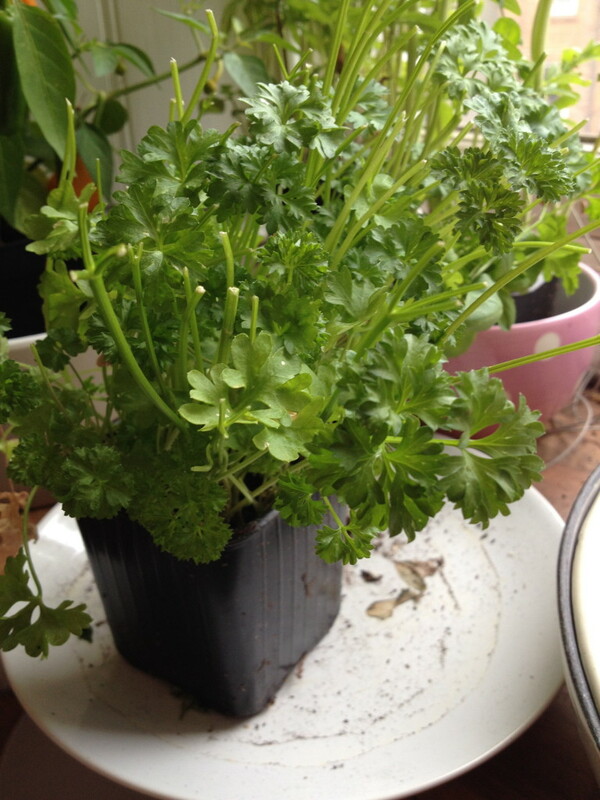 Those pots of parsley from the supermarket last ages if you keep them watered, much better than the packets. I’m currently growing my own from seed, but it seems to be getting a bit out of hand! Posted in Good foods, Healthy eating and tagged food, health, herb, nutrition, parsely, vitamins.